The urbanization of Springwater? Is this what we want? Meet Midhurst – Springwater’s Gateway to Sprawl. 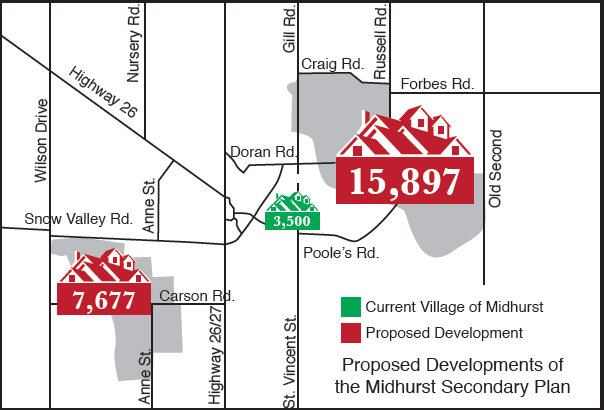 As you can see, the Midhurst Secondary Plan (MSP) as outlined above represents massive growth of a small village of 3,500 people. Midhurst does not have sewer services nor the amount of roadways required to effectively transport the planned 30,000+ people. The neighbourhoods are planned to be located on prime farmland – almost 2000 acres total. Our estimates show that the funding shortfall for this plan could be at least $9 million dollars. Springwater Council has yet to produce a long term cost analysis to show that bringing an additional 25,000 (at least) new residents provides a net benefit to the existing community. For example, the cost of more services, policing, fire, maintaining, operating and upgrading roads and other infrastructure comes at a cost direct to the Township and its taxpayers. How will be pay for these costs? 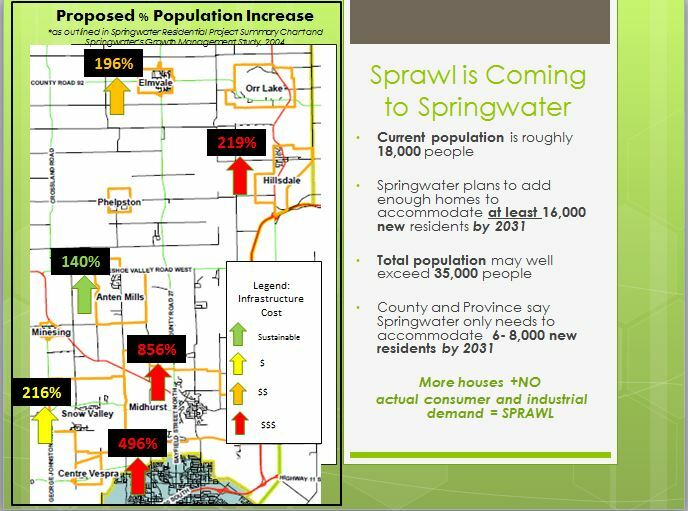 Does it not seem likely that this will only put Springwater on the sprawl path – one that leads to more growth, urbanization of an entire township, more debt and higher taxes? Last election, we heard many candidates talk about ‘smart growth’ and ‘sustainable growth’. Yet, here we are almost 4 years later looking at a map that indicates to us that the very nature of our rural township is about to change. With an 856% population increase, Midhurst will be the size of Orillia – the new capital city of Springwater? Where does that leave other communities? If you, like us, want to ensure that we grow in a way that is financially sustainable, preserves our farms, protects our environment and keeps Springwater beautiful, you should let your local councillor, Mayor and Deputy Mayor know. You can find their contact information here. Without your voice, without your concern, nothing will change.